Liberty has a fuller commercial folk-and-rock sound that includes the addition of string orchestration, female bgvs, organ, some country steel and harmonica. Rural-edged at times, in a Nashville way. 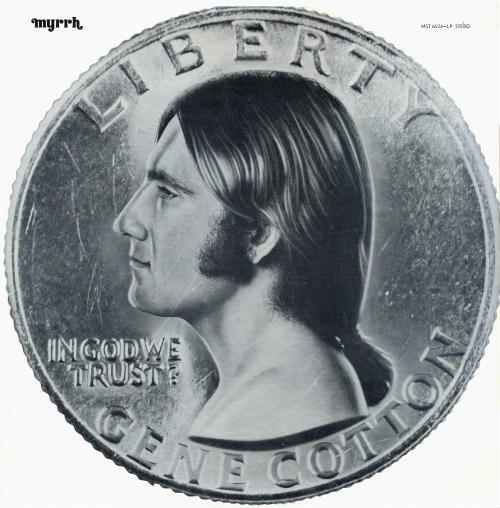 Several of Gene’s own songs are featured, including ‘Sunshine Roses’, ‘Man Buyin’ Names’, ‘Mrs. Oliver’ and ‘About You Girl’. As far as Jesus rock goes, there’s a gritty cover of Randy Matthews’ ‘Pharaoh’s Hand’, as well as a faithful treatment of Larry Norman’s ‘The Great American Novel’. The silver cover design of Gene’s ponytailed profile set in a quarter is pretty much the coolest thing ever. Followed by a number of secular releases on mainstream labels. (The Archivist by Ken Scott, 4th Edition).